When you think of Germany, do you think of rich deep fairy tale forests, coo-coo clocks, and castles perched on hills? 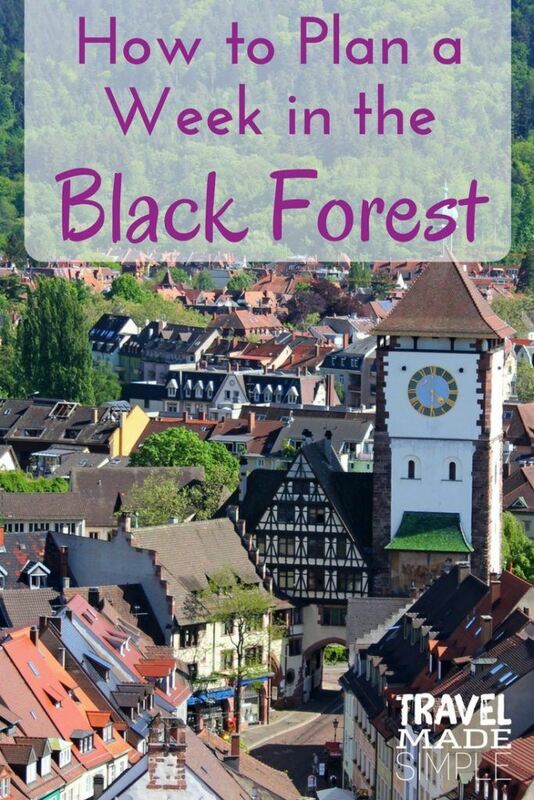 Then you probably have the Black Forest area in your mind. The region of Baden in the southwest of Germany is home to the Black Forest and more. It is an area where you can hike over forested hills all day and still be back at your spa hotel for a glass of wine without straining yourself. 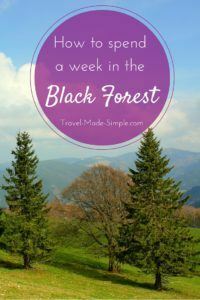 This post will show you an itinerary for how you can spend one week experiencing Baden and the Black Forest. It depends on what you want to do. If hiking is your thing, then summer is definitely your time. Spring can be blustery and rainy. Winter is cold and snowy, but if you stay closer to the cities, December can be really enchanting with the Christmas markets. This 1 week itinerary in the Black Forest will work any time of year, but you might have to make small adjustments for weather and daylight hours. Frankfurt is the primary airport for this area, though the Basel-Mulhouse airport just over the Swiss border has an Easyjet hub (and several other major airlines fly here as well) if you are coming from within Europe. There is a mainline train route that goes north-south through the region. This 1 week itinerary in the Black Forest is laid out for someone coming in and leaving from Frankfurt. If you are on your way from or to somewhere else (like the Rhine Valley), feel free to juggle the order. The old town is where the fun is at. The pedestrian parts of old town stretches from Bismarkplatz toward the foot of the castle. With only a few days, staying in the center will mean you won’t waste time on transport when you could be seeing things. If you do decide to be a bit outside of the center, make sure you find a place near a tram stop. Here’s the Heidelberg Transport Website. In addition to the main castle on the hill and the sights of the old town, if you have a free afternoon, check out Tiefburg Castle in the small suburb called Handschuhsheim north of the river. Not as large as the main castle, but far more intact and less crowded. Search for a hotel in Heidelberg here. Search and book a hotel in Freiburg here or book a room at Schutzen here. 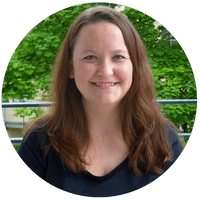 Baden-Baden and Strasbourg both can be enjoyed on a day trip from the other, so it kind of depends on what kind of feel you want. Do you want to spend a night in France in a larger city, then look at Strasbourg. If you are excited to enjoy a spa or want a more relaxed atmosphere, then angle toward Baden Baden. If you had more time, you could stay one night in each place if you wanted. Baden-Baden’s train station is quite a ways from the center of town, so don’t be worried about that. Leopoldplatz is the center of town, but pretty much anything in area between the green areas should be fine. If you are interested in a spa hotel, Baden-Baden has them. Many German sauna areas are clothing-forbidden, so do your research and know if you are ok with this. You can always stay in another place and get a day ticket to the spa if you are interested. Even though Strasbourg is a larger city than any other on this tour, the center is still very walkable. Look for a place inside the ring of the river to be in the thick of things. Read hotel reviews for Baden-Baden here or Strasbourg here. Transport in Germany by train is quite easy. In Heidelberg and Freiburg, look for day tickets, possibly group tickets if you have more than 2 people. When moving between cities, if you are ok with a bit longer ride for a cheaper cost, look at the Baden Tickets from Deutsche Bahn. They can be very cheap for groups and offer transport on local trains and buses in the region. The limitation of the Baden ticket is that it doesn’t reach to Strasbourg, nor can you use ICE/IC trains (you can’t use the white “fast trains”). You can buy small tickets to get from the German border to Strasbourg. Additional transport notes are in the specific days. This is a general itinerary and definitely should be used as a guide and changed to fit your desires. As written it is pretty full of activities, but only you can judge how much you want to take on for your vacation. Don’t expect to be able to see everything, and be ok with a day of just relaxing by the river or at a beer garden if that is what you want to do. Heidelberg is not in the Black Forest, but it is still in the same region called Baden. It was the headquarters of the American army in Europe until 2010 and home to one of the oldest universities in the country. Add looming castle ruins that are lit up at night and you have a romantic town that gets a lot of visitors. 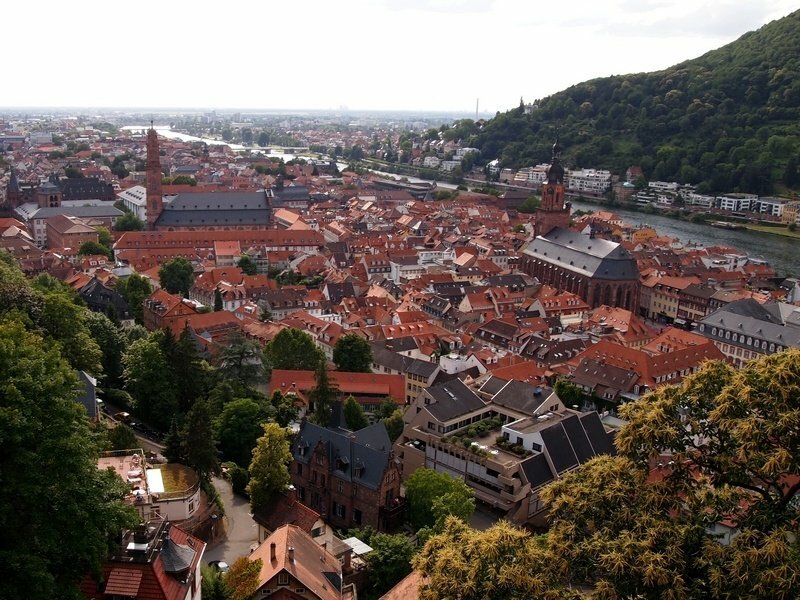 Heidelberg is one of the “classic” Germany tourist stops and you will definitely sense that wandering around town. Heidelberg Castle is hard to miss, perched on the hill above the old town. You can certainly walk up to it, but the more interesting way is to take the funicular train up the hill. Buy the combo ticket for both the castle and funicular for a much better deal. The castle itself is worth a good walk around. The basement houses an enormous wine barrel. Now that you have seen the castle from above, head back into town to experience things from ground level. Check out the cathedral (Church of the Holy Spirit) in the middle of market square. Walk across the old bridge with its distinctive towers. There is a lot of interesting architecture around the old town, including the university library and a rubblestone hay barn that once housed university lectures. Across the river from the old town winding up the hill is the Philosopher’s Way. Take one of the bridges across the river and make your way up the switchbacks to get a great panorama of the city. The Heidelberg Castle is mostly in ruins due to scavengers, but in the small suburb of Handschuhsheim (Glove’s Home) lies the Tiefburg castle. It is still intact enough to be used by the town for offices. If you want to see a slower pace place away from the tourists, head north of town to explore this area. The river Neckar flows through town. There are boat trips on the river that gives you a look at the town from a different view. More info here. The mountains continue above Heidelberg Castle up to the Koenigsstuhl (King’s Seat). You can reach this area by taking the funicular to the end station beyond the castle. Molkenkur is an inn halfway up the mountain where you change from the lower to the upper railway. The view of the city is impressive there as well. The whole area is covered in trails to hike. If you are interested, check in at the tourist office for maps and information. Freiburg is another medieval town and home to another old university, but at the other end of Baden, it has a different feel and is not on the big bus route tour of the country. Freiburg is well known in Germany and has its share of visitors, but not in the same volume as Heidelberg. It is also very firmly attached to the Black Forest. An extension of the hilly pine forest extends into town. The old town is where you should start your visit. The sandstone cathedral can be climbed for a view from above. The market square around it bustles with a market every morning except Sunday and is a great place to try a Lange Rote (the local type of sausage). In the back corner of the square next to the red turreted Kaufhaus is the City Museum of Freiburg. It is small and all in German, but has some neat models of what the city looked like in the past. Much of Freiburg’s charm is found in the shady squares and beer gardens where people watching and a relaxing drink await you. Niemansstrasse has a number of places with outdoor seating for food and coffee. Feierling Brewery is near Augustinerplatz and has a beer garden across the street. It is a very local unfiltered beer that does not get exported, so is nicely unique. Read more about German food culture here. As you explore town you will likely notice two things. First the tiny gutters running with water on nearly every street. They are called Baechle and also a unique thing to Freiburg. The second thing you might notice are the still standing gates. The one near the center of town is called Martins Tor and has a McDonald’s in it. The shorter one near where you get the stairs up to Castle Hill is called Schwabentor. Head up the stairs at Schwabentor to climb up on Castle Hill. There is a restaurant and neighboring beer garden with wonderful views of the valleys. Further up the hill is Cannon Plaza as a memory of the castle that isn’t there anymore. A more detailed Perfect Day in Freiburg can be read at Andy’s site. Schauinsland translates to Look-into-the-countryside. It is a peak with a observation tower in the Black Forest and is reachable via a long cable car run. It is a fun walk through the forest proper and on a nice day you can supposedly see the tips of the Swiss alps. Take the tram toward Gunterstal to the end and switch to the bus to the base station of the cable car (Schauinslandtalbahn). Check the Schauinsland website for more info. There are plenty of marked hiking trails from here. This is the land of Hansel and Gretel so be aware of your surroundings and ideally have a map if you want to do some further range hiking. Transport Tip: Schauinsland is in region 3 of the Freiburg transport network. Schauinsland gives a good view of the rolling pine-covered hills of the Black Forest. Now take a train up into the high forest to Titisee. This is an alpine lake up in the mountains and always a little cooler than down in town, making it a getaway in the summer. The lake has several boat options for exploring it. Rent a paddle boat to get out on the water yourself or take a boat tour. The Black Forest is known for the coo-coo clock. Titisee is as good a place as any to buy one if that is your thing. The main street is lined with tourist shops offering everything from kitsch to clocks and sausage to liquor. They will ship to most anywhere for an extra fee. 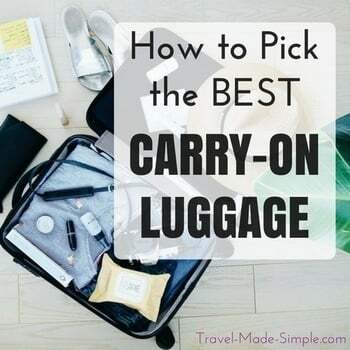 Think about this before you try to shove it in your bags to carry home. If you want to get away from the tourist presence even more, there are options. 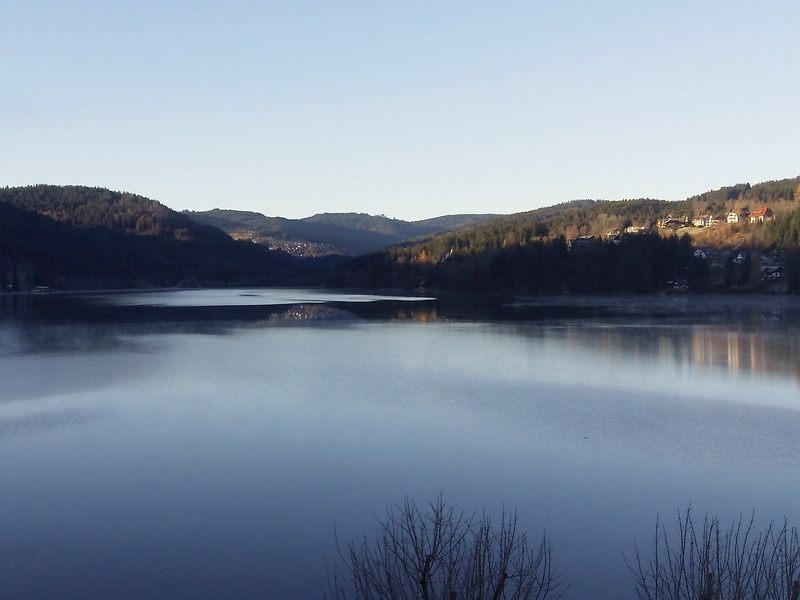 Take the train from Titisee higher to Schluchsee, an even bigger lake with hiking and biking trails all around it. Feldberg is also reachable from Titisee and is a ski-slope in the winter. On your way between Freiburg and Titisee you will be going through the Hoehlental (Hell Valley), so named due to warm winds that come out of it in the summer. The small town at the bottom of the valley is called Himmelreich, which means Heaven, for a bit of German irony. As you go up the valley try to keep your eyes open on the cliffs for a tight spot call the Hirschsprung (Deer jump). There is a statue of a deer perched at the top. It is so narrow that it is said that a deer could jump over it. Transport tip: Titisee is in region 3 of the Freiburg transit system. Transfer tip: Especially if you want to do a lot of activities in Baden-Baden or Strasbourg, consider checking out of your Freiburg hotel this morning, leave your bags in a locker at the train station and catch a late afternoon train to your next destination for dinner in a new place and a fresh start the next morning. 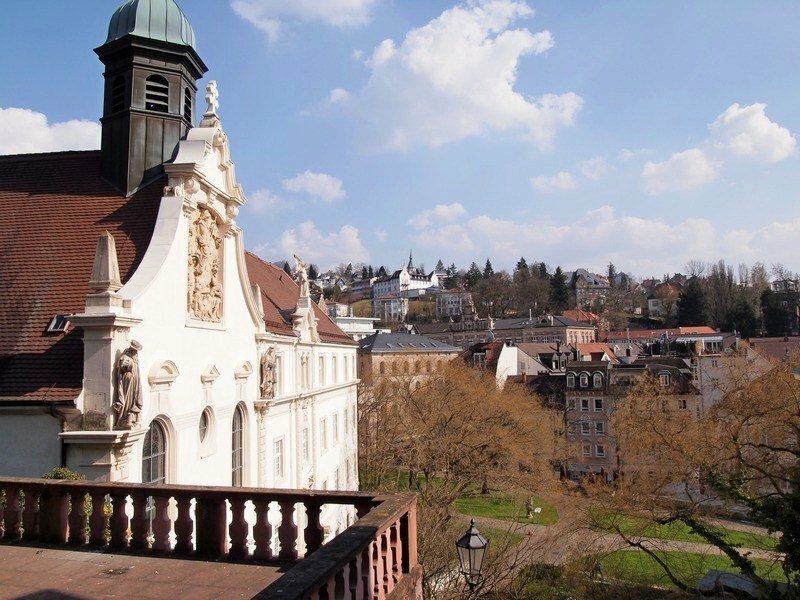 Baden-Baden has been a spa town since the Roman era. Soldiers were sent to recuperate and “take the waters” in this quite Black Forest town. In the 1800s it was the favorite escape of the European nobility. It was the place to see and be seen during the hot summers and that feel has permeated the town as it is today. So the spa town flair is still there, but there is history as well. The arcades of the pump house is typical architecture for spa towns of these era. It is also home to the town’s tourist info. The remains of the soldier’s bath from the Roman times are still available to visit. The opening times are a bit short (an hour just before midday and an hour in the afternoon and closed in the winter), so check them out if this is important to you. Info and opening times can be found here. A short bus ride from the center of Baden-Baden is the bottom station of the Merkur Funicular which takes you to the top of the nearby mountain for views of the entire region. Info website here. The town has been a center of relaxation and leisure for its entire history. Don’t stress yourself here. There is a green park along the river Oos just made for strolling and picnics. If “taking the waters” is your thing, check out one of the spas in town. The four big ones are under the Carasana banner with info here. A note about German spas and sauna areas: Many of them are nudist, meaning clothing isn’t just optional, but forbidden. Definitely do some research and ask questions to know what to expect. 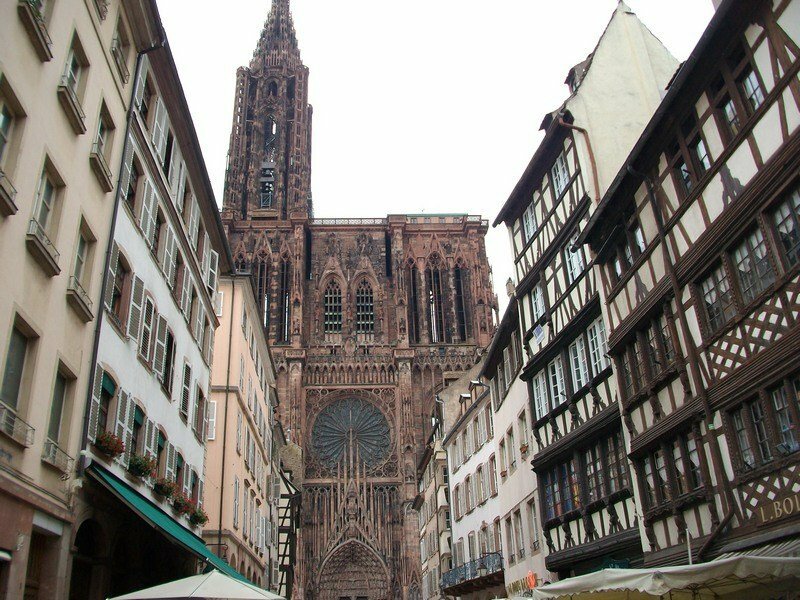 Strasbourg is in Alsace on the French side of the Rhine. Alsace once was a part of Germany, and then it was French, and then it was German again, and now back to France. This flip-flop of national allegiance has given the region a bit of an independent sense. The most well known sight in town is the massive cathedral, including a tower to climb, and its astronomical clock. Info Website for prices and times here. For a view of the city from the water, check out a boat tour on the river. Much of Strasbourg’s charm can be enjoyed by just wandering the pedestrian streets. Place Kleber is a wide open square rings with cafes with people watching opportunities. On the southwestern end of town is an area of canals and tiny winding streets called Petit France. Wine, Charming Villages, and a Castle: If you have no interest in Baden-Baden or just have more time to spend on the French side of the river, check out this full day tour from Strasbourg to some of the small wine towns in the region as well as one of Andy’s favorite hilltop castles. Do you have more than a week? Especially if you like hiking and nature exploration there are plenty of day hikes around any of these stops. The Kaiserstuhl is an extinct volcano near Freiburg that is the region’s wine growing area. Breisach near Freiburg overlooks the Rhine. Colmar is reachable from Freiburg by bus and gives a bit of a smaller town view of France. If you are heading north from Heidelberg, check out our one week itinerary in the Rhine Valley. Strasbourg can be a good jumping off point for some time in Paris. Check out our one week itinerary in Paris as well. Have you been to Germany’s southwest corner? 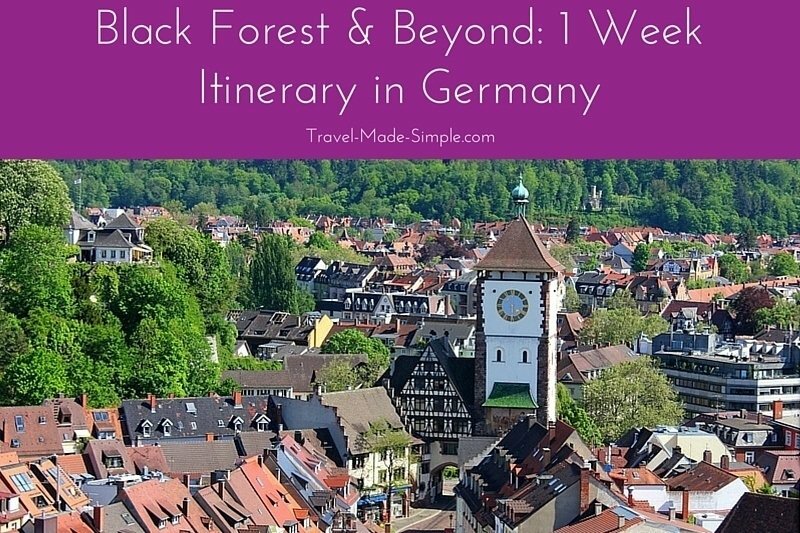 What else would you include on a 1 week itinerary in the Black Forest? What a romantic looking place … I love to tour this part of Europe with my partner! Hey Ali .. this is Darshna from India. I am so glad I found your blog post on pinterest. It’s super helpful! Anyone reading this will benefit from it. And most of all … I want to say a big heartfelt thank you because you took the time to read and answer my emails! I’m so glad I was able to help! I hope you have an amazing time in the Black Forest and the rest of your trip! Thanks for your blog as it was very helpful. We think we will be there in the Black Forest in early September so was wondering what you think the weather will be like then? Hi Silvia! The weather should be nice in early September. That time of year it can still feel like summer (but remember summer there rarely gets *really* hot) or it could feel like fall. It’s worth packing layers so you can wear short sleeves if you get warm or throw on a long sleeve and a jacket if it gets cool. I would expect the weather to be pleasant that time of year, sounds like a great time for a trip to the Black Forest! My husband and I are planning a week in the Black Forest area in the end of March 2018. The main reason why we chose this area is because we want to get away from the maddening crowd and keep our holiday close to nature. Fun things to do other than seeing museums /shopping /hanging around large cities. Memorable experiences that we could try our hand at. Hi Ritu, I have more experience in the area than Ali, so I will give you my thoughts. She might chime in if I miss anything. the Black Forest is actually a pretty big area. It stretches from the Swiss border all the way up to near Karlsruhe and then as far east as Stuttgart. If you are planning to spend only a week and want mostly a relaxing time, then I would suggest to pick only one or two cities to base yourselves in and do daytrips. If you are comfortable driving, you will have more flexibility than using the trains, thous trains through the mountains are fun. We know Freiburg the best because we used to live there. It is located in the south western end of the forest and makes a pretty good base. It will give you good access to most of the southern and western half of the region and access to France and Switzerland as well. Since it is a university town, things are going on nearly all the time and although a small city, there are plenty of food options in the center. This is usually my recommendation when talking about the area. Easy Treks – You can hike a number of different hills around the area. The easiest for example is up Schlossberg right in the center of town, which is more of an upward stroll than a hike. Walking along the Dreisam river in either direction is fairly flat and can give you a long distance goal. I had friends who would regularly hike/mountain bike up around Kandel and Notschrei, though I never tried that. Your best bet is probably to get a hiking map either at the tourism office or a book store and pick something that feels reasonable to you. Feldberg is the tallest mountain in the area and is mostly sking in the winter, but there bound to be trails there too. Be aware that late March is likely to still be pretty cold, especially high in the forest. So bring warm clothing and check weather as you get closer for rain gear needs. German Food – In Freiburg… check out Feierling Brewery for super local beer. Tacheles in a basement on Grunwalderstrasse for good Schnitzels in town. For a bit out of the center, Schutzten (around the MariaHilf Kirche tram stop) has really great food in a German tavern atmosphere. Make sure you hit the Cathedral Square around noon Monday-Saturday at least once. The market runs from early in the morning until about 1pm. Hunt out the row of trucks and get a sausage in a roll. The local one is called “lange rote” and is a long reddish pork sausage. Fun Things – Take the Schauinsland cable car. It is a short tram right from the center + a bus to the base of the cable car which is a great ride on a sunny day. From the top you can walk to an observation tower for even better views. The whole area is a spa area. Heated mineral springs feed a number of spas and it is nice, especially in the cold days, to soak in the hot water. Eulen-Keidel Bad is on the edge of town and pretty good local place. There are certainly others around the region. Be aware that sauna areas are almost always naked required and some spas even require it for the whole place. Titisee and Schluchsee are lakes up in the forest easily reachable from Freiburg via train. Titisee town is almost a resort with kitschy souvenirs and such, but worth a walk around. Schluchsee is bigger and more quiet, also a nice hike around. There are several small abandoned castles in surrounding towns. http://www.aliadventures.com/2014/10/monty-python-in-my-back-yard/ This is Ali’s post on her personal blog about one near Waldkirch. There are a few bigger better kept castles in the forest, but more toward Stuttgart than Freiburg. But if you have a car and a day to burn, look at Lichtenstain Castle, Hohernzollern Castle near Stuttgart or Hautkonigsberg over the river in France. Definitely get yourself a map/GPS if you try this. Not sure I have much in the way of “memorable experiences to try” that I can think of. The region is really based on nature and such. Hope this helps and enjoy your week. Thank you for your message and thoughts. Your suggestions are exactly what I was looking for ! I am already excited about this trip thanks to you . We are planning a trip for 1 week to the Black Forest, end of September. How is the weather like? Better to go earlier? Rain? Hi Carlos! It can really vary that time of year. It might be gorgeous and warm, but it could also be cool and rainy some days. You could look up historical weather info and see if it fits with what you’re hoping for. I don’t think late September is a bad time to go though, you just have to keep in mind that there is always the possibility of rain. Probably the earlier in the month you can go, the better your chances of not getting cooler or rainy weather. But chances are it won’t be overly hot, so that’s good. Sorry I can’t give you a definite answer on this one! Hi Ali, thanks for your note, I will review the weather information as well as the travel dates. Hi. This guide is really helpful. I would like to make a 10-days stay in Germany and black forest will be the focus. Just wonder whether public transport is convenient to travel around the black forest region. I will very likely be travel solo and without a car. Hi Grace! You can get to most places with trains, and then just about every town has trams and/or buses. Here is the Deutsche Bahn site in English so you can search for your routes and see how long it takes and if there are connections. I find Germany pretty easy to get around in without a car, so I think you’ll be fine! I am planning a trip to the Black Forest over Christmas time. We want to stay at the town closest to hiking trials so we do not have to drive to hike and such. What town would you suggest? Hi Erica! First, make sure you’re prepared to be hiking in snowy conditions. I used to live in Freiburg, so that’s the area I usually recommend to people. 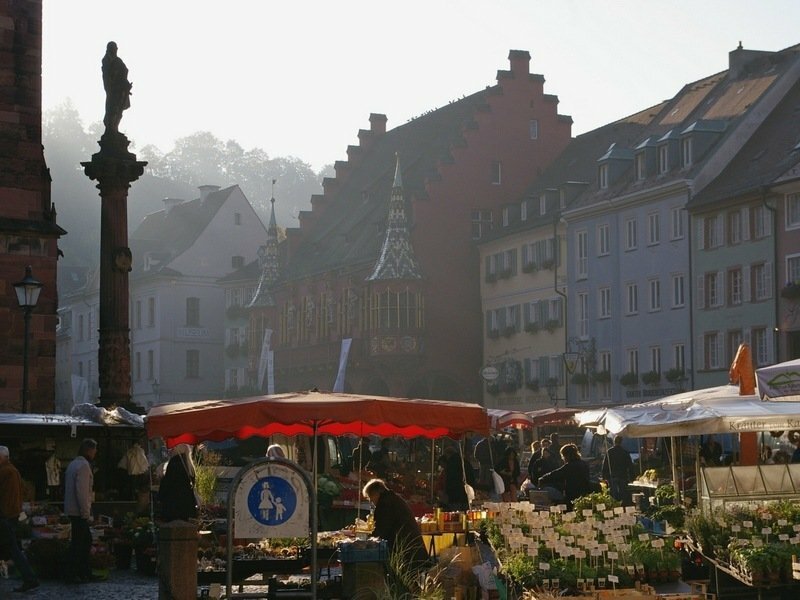 If you want to stay in a bigger town, Freiburg has lots of accommodation and restaurant options. If you’re looking for something smaller, Titisee and Schluchsee are lake towns (See means lake in German) not too far from Freiburg. It might be better to go the other direction – decide what hiking trails/areas you’re interested in, and then look for nearby towns. 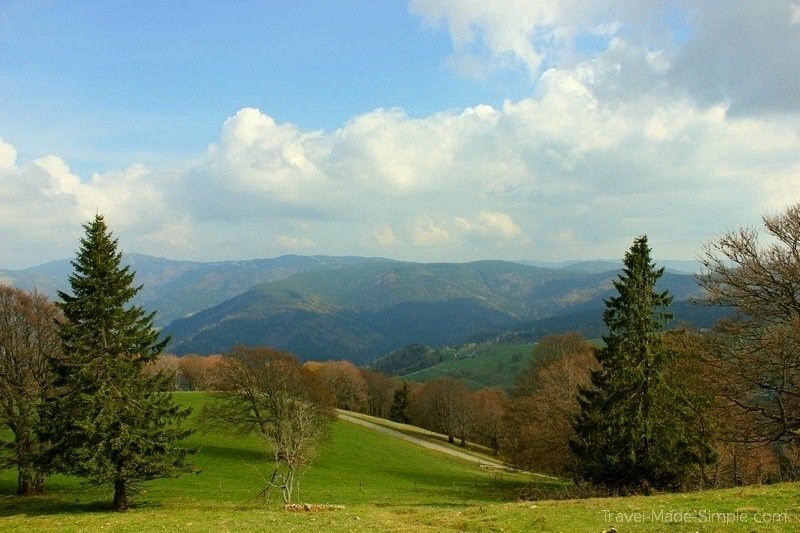 The Black Forest tourism site has some info about hiking that might be a good starting point: https://www.blackforest-tourism.com/discovery/hiking. Does hosts in Freiburg provide konuscard as I have heard it gives free acess to all public transport in the black forest area and we won’t be driving so that’s preferable. Thanks a lot in anticipation of your reply. Hi, check out this site for more info about the KONUS card. It sounds like it’s up to each individual hotel to decide if they want to give them out, so you’ll want to check with your hotel to be sure.